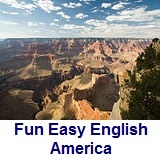 ﻿ Fun Easy English - Travel the United States of America - Colorado. Learn before you travel. 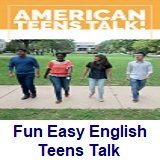 This section of Fun Easy English focuses on facts and other cool stuff about your favorite U.S. state. 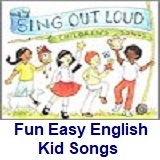 This is great English reading practice. 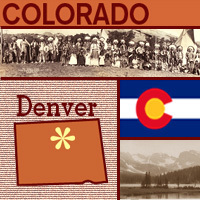 This page focuses on the state of Colorado. Called the "Centennial State," because it became the 38th state when the U.S. turned 100 in 1876, Colorado is most closely associated with the Rocky Mountains and has numerous peaks over 14,000 feet. The state's name comes from a Spanish word meaning "red" or "ruddy," the color of much of the state's terrain. Today, Colorado is known for its vast cattle ranges, agricultural acreage, and snow-covered mountains that are ideal for winter sports. Its capital is Denver and state flower is the Rocky Mountain columbine. The Colorado state flag consists of three equally sized stripes; the outer stripes are the same color blue as the national flag, separated by a white center stripe. 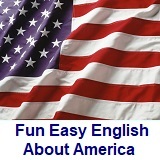 There is a large semi-circular "C" on the flag, which is the same shade of red as the U.S. national flag. In the opening of the letter "C" there is a gold disc. Origin of Name From the Spanish for the color red, which was applied to the Colorado River. Travel and tourism site for Colorado - This state travel and territorial tourism site provides ideas for your vacations, meetings, and more. Did you know that Colorado used to be owned by Spain? In the early 1700s the area that is now Colorado was claimed by Spain, and eventually France controlled most of it. Later, in 1803, the Eastern part of Colorado became part of the Louisiana Purchase (a deal between France and the U.S.), with the rest remaining in Spanish, and later, Mexican, control until 1848. In Denver, Colorado, and many other cities, people of Hispanic and Mexican descent have a Cinco de Mayo festival with storytelling, parades, food, and dancing to the beat of salsa and mariachi music. Cinco de Mayo is Spanish for the Fifth of May. On this day in 1862 Mexican peasants won a battle against French invaders in Puebla, Mexico. Many people mistake Cinco de Mayo for Mexican Independence Day, but that happened on September 16, 1810 -- more than 50 years earlier. This Hispanic celebration began in Denver in 1987 as a small neighborhood street festival. By 1996 the weekend event had become so large -- attracting a half-million festival-goers -- that it moved to its new home in Denver's Civic Center Park. Does your city have a Cinco de Mayo celebration? The next time you have the opportunity, go and help celebrate! Every year American Indians have a powwow in Denver, Colorado, that attracts people from all 50 states and 14 countries. A powwow is a social gathering of Indian peoples to honor their heritage that has been passed down through generations. More than 80 Indian tribes come to the Denver March Powwow to celebrate their history and culture through arts and crafts, storytelling, music and dance. There are many different types of powwow dances. During InterTribal dancing, everyone from all the different tribes and all age groups dance together. 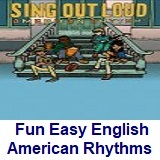 Even though they are dancing as a group, each dancer moves independently to the beat of the drum - expressing his or her own feelings and creating a unique style. Other dances include the Men's Traditional Dance. This is the oldest form of Indian dancing, and historically only the warriors were allowed to dance in a circle. This dance is a form of storytelling in which the men act out things they have done in battles or on a hunt. In the Women's Jingle Dress Dance, women wear dresses with "jingles" on them and dance in a sort of side-step around a sick person in order to help cure him. Just like the story about the little train that could, if you think you can, you can. If you can walk, run or wheel, you can take part in the "Oh Yes You Can" race in Boulder, Colorado. Every year on Memorial Day, Boulder, Colorado, hosts the Bolder Boulder 10K road race. This race is open to everyone and includes a wheelchair race and a walkers' race. It also includes Marine Corps units who march to honor fallen American soldiers. This is the fourth largest road race in the world and the one of the largest tributes to American veterans in the U.S. on Memorial Day. Because the race is so big, organizers needed to figure out a way to include everyone and still have an official race. So they came up with the idea of the "wave." Runners are placed in "waves," groups of up to 900 people, with staggered start times. Faster runners are put in the first waves and slower ones are placed in the following waves. A new wave is started every one to two minutes, and the start and finish times for the runners in each race are recorded. This way everyone gets to race without the slower runners getting in the way of faster ones. Have you ever been in a race that had "waves"? 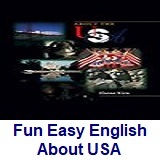 Many people know that the Rocky Mountains make up an enormous chain of mountains in western North America that extends 3,000 miles from Canada through the United States to Mexico. But did you know that the tallest mountain in Colorado, part of the Rocky Mountains, is called Mount Elbert, which is 14,433 feet high? The Rocky Mountains form the Continental Divide, the mountainous ridge that runs north to south along North America and causes water to drain in separate rivers flowing to different sides of the continent. Eventually, these rivers lead to the Atlantic and Pacific Oceans as well as the Gulf of Mexico. In 1915, Congress designated some of this mountainous area in Colorado as Rocky Mountain National Park. The tallest mountain in this park is Longs Peak, which is 14,256 feet high. Can sweet corn save a town? It can if that town is Olathe, Colorado! The town of Olathe used to grow sugar beets and barley, but by the late 1970s those crops weren't in much demand anymore. The town fell on hard times because it depended upon the success of the farmers to survive. Then a farmer named Dave Galinet, who had developed several varieties of sweet corn, decided to move his business to the Olathe area. Olathe had the ideal climate for growing sweet corn - hot days and cool nights. Soon after that, many of the other farmers started to grow sweet corn too, and before long the town was prosperous again. Olathe decided to celebrate the fact that it was thriving, and what better way than to have a sweet corn festival? 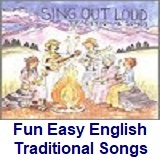 The first festival was on a rainy day in August 1992. And guess what? More than 800 people showed up. Nowadays about 20,000 people come to the festival. And you know what they get to do? Eat all the sweet corn they want. In 1999, participants ate 70,000 ears of "Olathe Sweet" donated by the growers. Can you imagine how many people there were to eat that many ears of corn? Whether or not the clown in the picture lives in Littleton, Colorado, or is just visiting, he will always be welcome there. That's because if you have ever lived in or visited Littleton you are invited every year to come back for a "homecoming." The people of Littleton like their community so much they have a big party each year that they call Western Welcome Week. About 1,200 volunteers help organize a circus, parade, fireworks, and more for families and the community to enjoy during this 10-day event. Houstoun Waring, the longtime editor of the Littleton Independent, founded Western Welcome Week in 1929 as a way to promote the city. His idea was to celebrate the 100th birthday of city founder Richard S. Little with a "Homecoming." Originally Homecoming was set for May 12, 1929, Little's birthday, but when it was pointed out that railroad rates dropped in August and people could come from far away for less money, they changed the date to August, which is when the event is held today. The following is a description of national forests, parks, and monuments in the state of Colorado. If you plan to visit or live in Colorado for awhile then you should definitely plan to visit some of these fantastic places. 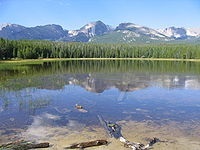 Arapaho National Forest is in the high Rockies and includes six wilderness areas. It is currently managed jointly with Roosevelt National Forest and Pawnee National Grassland. The highest paved road in North America ascends Mount Evans at an elevation of 14,265 ft (4,348 m). In western Colorado, Grand Mesa National Forest covers part of Battlement Mesa and most of Grand Mesa, the largest flattop mountain in the world with an average elevation of 10,500 ft (3,200 m). There are over 300 lakes in the forest. It is managed together with Gunnison National Forest and Uncompahgre National Forest. Gunnison National Forest is located in the Rocky Mountains near Gunnison, Colorado. Among the seven wilderness areas in the forest are the Maroon Bells-Snowmass Wilderness. The Slumgullion Slide is a giant landslide due to the mineral montmorillonite. Including the La Sal and Abajo mountains of eastern Utah, elevations in this forest reach 12,721 ft (3,877 m) on Mount Peale. The Dark Canyon Wilderness is the only wilderness area in the forest. This national forest is also partially located in the state of Utah. This forest contains many ranges of the Rocky Mountains with elevations ranging from 5,500 ft (1,700 m) to 12,940 ft (3,940 m). There are ten wilderness areas and Rob Roy Reservoir, which covers 500 acres (200 ha). 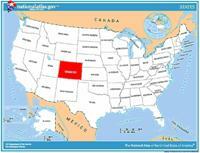 This national forest is also partially located in the state of Wyoming. Pike National Forest includes Pikes Peak at an elevation of 14,115 ft (4,302 m) and three wilderness areas. Since 1975 the forest has been managed together with San Isabel National Forest. Located in the Rocky Mountains of northern Colorado, Roosevelt National Forest has part of six wilderness areas. It is managed together with Arapaho National Forest and Pawnee National Grassland. There are 19 of Colorado's 54 fourteeners in San Isabel National Forest, including the highest point, Mount Elbert at 14,440 ft (4,400 m). The forest includes the Sawatch Range, Collegiate Peaks, and Sangre de Cristo Range and is managed together with Pike National Forest. 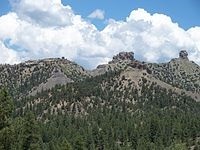 San Juan National Forest includes Chimney Rock National Monument and elevations that range from 5,000 ft (1,500 m) to over 14,000 ft (4,300 m). The forest's Weminuche Wilderness is the largest in Colorado at 499,771 acres (202,250 ha). The northern portion of the San Juan Mountains and the Uncompahgre Plateau are located in this National Forest. The forest also contains Uncompahgre Gorge and three wilderness areas. White River National Forest has eight wilderness areas, twelve ski resorts, four large reservoirs, 2,500 mi (4,000 km) of trails, 1,900 mi (3,100 km) of roads, and ten peaks higher than 14,000 ft (4,300 m) in elevation. The park protects a quarter of the Gunnison River, which slices sheer canyon walls from dark Precambrian-era rock. The canyon features some of the steepest cliffs and oldest rock in North America, and is a popular site for river rafting and rock climbing. The deep, narrow canyon is composed of gneiss and schist which appears black when in shadow. The tallest sand dunes in North America, up to 750 feet (230 m) tall, were formed by deposits of the ancient Rio Grande in the San Luis Valley. Abutting a variety of grasslands, shrublands, and wetlands, the park also has alpine lakes, six 13,000-foot mountains, and old-growth forests. This area constitutes over 4,000 archaeological sites of the Ancestral Puebloan people, who lived here and elsewhere in the Four Corners region for at least 700 years. Cliff dwellings built in the 12th and 13th centuries include Cliff Palace, which has 150 rooms and 23 kivas, and the Balcony House, with its many passages and tunnels. Bisected north to south by the Continental Divide, this portion of the Rockies has ecosystems varying from over 150 riparian lakes to montane and subalpine forests to treeless alpine tundra. Wildlife including mule deer, bighorn sheep, black bears, and cougars inhabit its igneous mountains and glacial valleys. Longs Peak, a classic Colorado fourteener, and the scenic Bear Lake are popular destinations, as well as the historic Trail Ridge Road, which reaches an elevation of more than 12,000 feet (3,700 m). 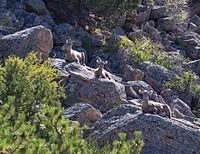 Protects 21,500 acres of steep cliffs and colorful rock outcroppings overlooking the Arkansas River in Chaffee County, Colorado, as well as the area's rich native history. Surrounding Hovenweep National Monument, it preserves and protects more than 6,000 archeological sites, the largest concentration in the U.S.
Monument Canyon runs the width of the park and includes rock formations formed by erosion. The monument includes 20,500 acres (83 km2) of semi-desert land high on the Colorado Plateau and has a wide range of wildlife including pinyon pines, juniper trees, ravens, jays, desert bighorn sheep, and coyotes as well as a range of recreational activities. This sandstone and conglomerate bed, known as the Morrison Formation, was formed in the Jurassic Period and contains fossils of dinosaurs including Allosaurus and various long-neck and long-tail sauropods. 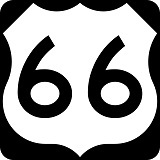 This national monument is also partially located in the state of Utah. 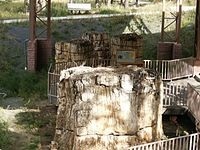 Huge petrified redwoods and incredibly detailed fossils of ancient insects and plants reveal a very different landscape in Colorado of almost 35 million years ago in the Eocene age. Hovenweep contains six clusters of Native American ruins. Holly Canyon, Hackberry Canyon, Cutthroat Castle and Goodman Point are in Colorado and Square Tower and Cajon are in Utah. 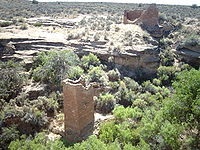 Ancient Pueblo Peoples lived in the Hovenweep area from 1150 to 1350. This national monument is also partially located in the state of Utah. 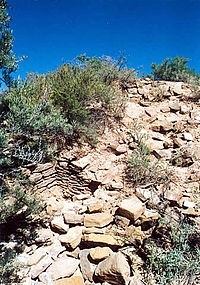 Designated a research national monument, it is a large, unexcavated Ancestral Puebloan archeological site. The site is one of many Ancestral Puebloan village sites located in the Montezuma Valley occupied between AD 900 and 1300. This video is all about Black Canyon National Park. This video is all about Great Sand Dunes National Park. This video is all about Rocky Mountain National Park.